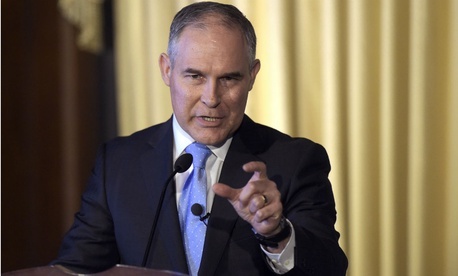 The Environmental Protection Agency has set aside $12 million to provide financial incentives to employees to leave their jobs, taking the first step necessary to fulfill a commitment from President Trump to shrink EPA. Following guidance from the Office of Management and Budget requiring all agencies to map out civilian workforce reductions and a preliminary budget request suggesting the agency cut 3,200 jobs, EPA issued a memorandum in April announcing its plans to complete a buyout and early retirement package this year. The new memo, sent this week from acting Chief Financial Officer David Bloom to agency leadership, spelled out the funding for that initiative. Bloom said he determined the total after Congress passed the fiscal 2017 omnibus spending bill, which allocated $8 billion total to the agency. EPA will use carryover funds previously set aside by leadership to pay for the $12 million in incentive payments, Bloom said. Part of the excess money -- $800,000 -- will also go toward “travel for the administrator’s protective detail.” Administrator Scott Pruitt requested his own 24/7 security team in April. Agencies can offer up to $25,000 to employees who have worked in the federal government at least three years through a Voluntary Separation Incentive Payment and allow employees not otherwise eligible for retirement benefits to receive them through Voluntary Early Retirement Authority. The Office of Personnel Management must approve all early out and buyout programs; the agency said as of earlier this month that no federal entity, including EPA, had yet requested the authority. OPM has established a team to approve any such requests within 30 days. EPA has begun holding informational hearings with employees at regional offices to notify them of their separation options. Bloom said OMB would will review its fiscal 2017 spending plan by May 25, warning resource management staff “will need to prepare the data under a challenging schedule to adhere to the deadlines.” It plans to complete its current separation incentive program by Sept. 30. While OMB directed agencies to take immediate actions to begin cutting their workforces, they have until June 30 to submit preliminary plans for long-term reductions. After consulting with OMB, agencies will finalize those plans in their fiscal 2019 budget proposals. The Trump administration suggested slashing EPA’s fiscal 2018 funding by 31 percent and eliminating entirely more than 50 programs. The administration will spell out more details next week when it releases its full budget. The news was not all bad for EPA employees in Bloom’s memo; in addition to the separation incentive money, EPA has allocated enough funds for 1 percent of spending on General Schedule salaries to go toward performance awards.